The latest Chance McKinney news and updates. From concert announcements to ticket giveaways, we'll keep you in the loop right here. 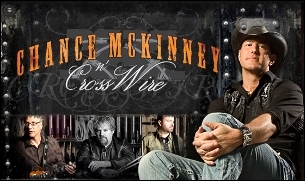 Chance McKinney and CrossWire have been goin', goin', goin' and this week is no exception. Coming off a week of shows in Oregon, the CMCW boys head back to Washington for a run at some good weather and great shows. Yes, we're fully aware that Kenny Chesney will be in town on Friday Night at the Tacoma Dome and yes, we know we have a show scheduled for that night as well. Hmmm, Kenny Chesney or Chance McKinney n' CrossWire... Kenny Chesney or Chance McKinney n' CrossWire? As you ponder which you'd choose why not make it easy and just do both?! Thursday Night (7/21): Let us get you geared up just a little Northeast of the Tacoma Dome in Kent, WA at the "Thursdays at the Lake" Concert Series in Meridian Park. “Industrialized Country” is a blend of country, rock, metal and soul. Friday Night (7/22): Kenny Chesney Night! However, in case you don't have tickets OR Tacoma is just too far to drive we'll be at the beautiful Tulalip Casino Resort with south Puget Sound's own Robbie Walden opening at 8pm. We'll be your Kenny Chesney Alternate... or, possibly your Kenny Chesney Chaser! Come on by the Casino on your way back from the Kenny Chesney concert and let us finish off the night for you. If you look at it that way, Kenny Chesney, Billy Currington and Uncle Kracker are opening up the night and Chance McKinney n' CrossWire are closin' it out! The biggest benefit to the CMCW show at the Tulalip... is that the Tulalip is pickin' up the bill. No cover charge. This claim cannot also be made about the Kenny Chesney concert. Last we saw, tickets we're goin' for $375 each in the front floor section on stubhub. So, if you're lookin' for a good "after party" for Kenny or you're runnin' low on scratch... we've got you covered. Saturday Night (7/23): IF, somehow, you haven't manage your "country fix" after Thursday AND Friday then the HARD ROCK CAFE in downtown Seattle, WA welcomes Chance McKinney n' CrossWire back to the stage. It ain't easy breakin' country into new venues... especially when the title of the place is "hard rock", but we're doin' our best. Bring a group downtown and leave a little redneck mark on Seattle's premier "live" music venue! The better the boys do, the more likely the HRC will have 'em back to the most centralized meeting spot for all the Puget Sound country fans.